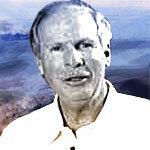 In 1990, Mr Arzú stood for President on behalf of PAN, coming fourth on 17% of the vote. The victorious candidate, Jorge Serrano Elías of the Solidarity Action Movement (MAS), appointed Arzú as his foreign minister. He soon resigned over the administration’s policy of recognising the neighbouring state of Belize, which it claims as Guatemalan territory and accepted office within PAN instead. In a subsequent coup in 1993, President Seranno abolished the Congress, though international pressure saw the swift restoration of a civilian regime. In November 1995, Arzú stood as PAN’s candidate in the presidential elections that followed, beating convicted killer Alfonso Portillo of the Guatemalan Republican Front (FRG) in the second round held in January of the following year. The FRG is largely composed of supporters of Efraín Ríos Montt, the former military dictator, though Portillo was previously a member of the DCG, who suffered under Montt’s rule, as did the bulk of their voters. Arzú’s main achievements as President were to end the 36-year civil war in the fragile Central American state by signing an accord with the insurgents and to root out corrupt elements in the country’s police force. A shadow was cast over his period in office by the assassination of a Catholic Assistant Archbishop, alledgedly by his own presidential guard, the feared Estado Mayor Presidencial. He is able to point to a quadrupling of government spending during his presidency, especially in areas such as education, healthcare, infrastructure and security. The results of his policies are said to include an approximate 10% decrease in illiteracy and in the mortality rate; a five-year increase in life expectancy; a reduction in crime; an increase in electrical coverage of the country by 20%; the doubling of the number of paved roads; a 300% increase in telephone coverage; a 25% increase in the minimum wage; and a 3% decrease in inflation. Constitutionally debarred from standing again in 2000, the candidate from Mr Arzú’s PAN, Óscar Berger, lost to the candidate defeated in 1996, Alfonso Portillo of the FRG. Mr Berger was subsequently elected to the presidency in 2004, alongside Mr Arzú as Mayor of Guatemala City, both candidates of PAN. Mr Portillo subsequently fled the country, having had his immunity revoked and under suspicion of corruption. Like President Berger, Mayor Arzú is a law graduate of the private Jesuit Rafael Landívar University. His policies have been described as neo-liberal and he is very much in the mould of the technocratic politicians of Latin America who stress the need to keep the International Monetary Fund on side, not out of realism but outright economic neccessity. Following independence from colonial rule, Guatemala, like many other countries in the region, has suffered from long periods of civil war, military rule, inequal distribution of wealth, low standards of education and poor relations with indiginous communities. Arzú’s outlook could best be described as post-ideological, in one interview he blasted Presidents Hugo Chavez of Venezuela and Brazil’s Lula as “anachronistic phenomena”. As Mayor of Guatemala City, he currently enjoys high ratings in opinion polls, not least because of his record as president, and is regarded as a competent administrator. The Mayor’s supporters point to his record in investing in municipal infrastructure, particularly the construction of a new metro system for the city. Mayor Arzú has been awarded various honours at both the national and international level, including the Prince of Asturias and International Cooperation Award (1997); the Feliz Houphout Boigny Prize, awarded by UNESCO; the Galardón Monseñor Leonidas Proaño Award, given by the Latin American Association for Human Rights, and an Honorary Doctorate from the University of De Paul in Chicago, among others. Guatemala City, to give it its full title, La Nueva Guatemala de la Asunción, is the capital and largest city in Guatemala. It is known locally as Guatemala, or informally as Guate. Population estimates range from one million to over 2.5 million. The city is located in a mountain valley in the south central part of the country. This can sometimes cause air pollution to stay concentrated within the city. The ancient Maya city of Kaminaljuyu is contained within modern Guatemela City. This dates back some 2,000 years, and its inhabitants are known to have traded with distant Teotihuacan in central Mexico. The centre of Kaminaljuyu was located a short distance from the older part of Guatemala City, and in the late twentieth century the modern city grew around its ruins - and in some cases over some of the outlying ruins before they became protected. The central ceremonial centre of Kaminaljuyu is now a park within the city. In Spanish colonial times this was a small town with a monastery called El Carmen, founded in 1620. The capital of Spanish colonial Central America was moved there after an earthquake destroyed the old capital Antigua Guatemala in 1775, and resulted in a great expansion of the city. 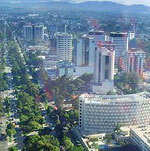 Guatemala City is the economic, governmental, and cultural capital of the country. In addition to a wide variety of restaurants, hotels, and shops, the city has some 30 art galleries and museums (including some fine collections of Pre-Columbian art). There are five universities, including the Universidad de San Carlos, the third oldest university in the New World.